The enormously versatile English actress Janie Dee is back in New York playing an award-winning, 55-year-old brand manager at a London cosmetics firm, the Swan Beauty Corporation. At the start, we see her character Linda deftly promoting anti-aging cream for the older woman at a marketing presentation. When the company president (John C. Vennema) decides to hire treacherous twenty-something Amy (Molly Griggs) to start promoting these same projects to a much younger demographic, though, Linda’s well structured life begins to unravel, including her seemingly near-perfect home life with her school teacher husband (excellent Donald Sage Mackay) and two daughters, Alice and kid half-sister Bridget. But is it really domestic bliss? It seems husband Neil is going through a mid-life crisis and the girls, particularly Alice, are deeply troubled. 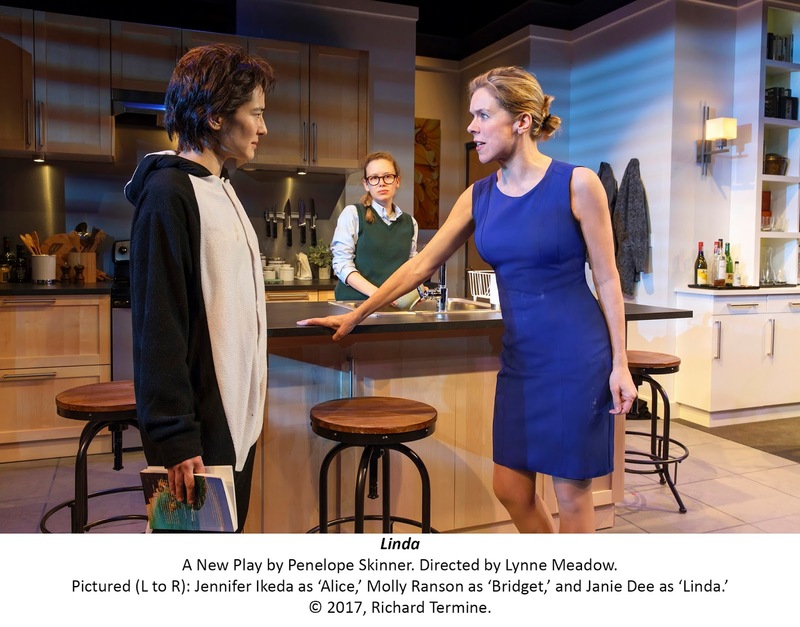 Penelope Skinner’s play -- which premiered at London’s Royal Court is 2015 by the English Stage Company -- deals with familiar feminist themes: ageism, beauty, sexuality, motherhood, and career. Skinner doesn’t always avoid a sense of contrivance, but the play holds one’s interest for its roughly two and a quarter hours. In London, the character of Linda was to be played by Kim Cattrall who withdrew, it was said, on doctor’s orders. Her last-minute replacement, Noma Dsmezweni, a Swaziland-born actress, garnered universal raves. I can’t say how Dee compares, but she is absolutely superb, and very much at the top of her game. Lynne Meadow directs a well-paced production on Walt Spangler’s nifty revolving set which encompasses Linda’s deluxe office, that of her boss, and her well-appointed kitchen. Dee projects convincing executive assurance, and when things in her life begin to go south, her panic and desperation seem painfully real. She really nails all aspects of the role. She’s not working in a vacuum, though, and all the performances are solid, particularly Jennifer Ikeda as Linda’s unhappy elder girl (who, for certain poignant reasons which emerge, perversely insists are wearing a skunk onesy to make herself “invisible” to men), and Molly Ransom as the sweet-natured Bridget who hopes to earn a part in the school play by auditioning with a male role (“King Lear,” as it finally happens), her dilemma mirroring the woman-in-a-man’s world themes of the play. Meghann Fahy is also good as another young woman who poses a threat to Linda. And Maurice Jones is Luke, a New Agey temp whose penchant for selfies brings disastrous consequences for Linda. Skinner’s dialogue is authentic and often amusing, the narrative absorbing, and the themes are sharply laid out, if generally familiar. Jennifer von Mayrhauser’s costumes, Jason Lyons’ lighting, and Fitz Patton’s sound design are all state of the art.